Connect your HDMI-compatible devices with this High-Speed HDMI 2.0 Cable from Kramer. 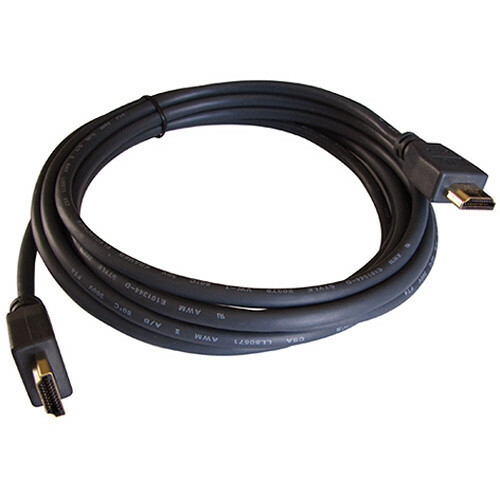 This 6' cable has molded HDMI connectors at both ends that are designed to resist erosion while providing reliable connectivity. This cable facilitates an uncompressed digital connection between your compatible electronic devices and display monitors—for example, connecting a Blu-ray player to an HD television. Box Dimensions (LxWxH) 7.6 x 6.2 x 0.6"
High-Speed HDMI 2.0 Cable (6') is rated 5.0 out of 5 by 2. Rated 5 out of 5 by Cleargraphics from It does the job. Nothing more nothing less. Nothing out of the ordinary.